"We've always been crazy in love with this city. . . . We love its arrogance, its clumsiness, its simplicity. And especially the women who live here." 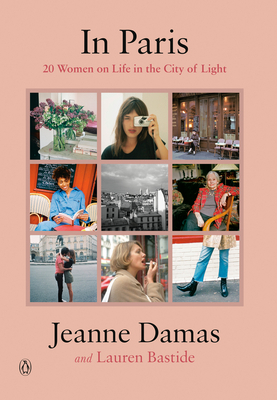 Two quintessential Parisian women--model and fashion designer Jeanne Damas and journalist Lauren Bastide--shine a spotlight on twenty real-life women of Paris, dispelling the myth that there's only one type of Parisian woman and introducing us to the city that real Parisiennes live in. They're booksellers, singers, writers, activists, and antique dealers; they live in small studios, spacious apartments, or houseboats; their ages range from fourteen to seventy . . . and all embody the effortless chic and insouciant spirit of the legendary Parisian woman. In Paris takes us into these women's lives, telling us about their careers, families, favorite nightlife spots, shopping habits, and beloved books and films. Full-color photos taken by Jeanne herself accompany charming lists of advice on the French art de vivre--from the best places to people-watch with a glass of wine after work to the perfect Parisian playlist to the ten things that a French woman would never, ever post on Instagram. Witty, elegant, and modern, In Paris is an ode to Paris through the eyes of its eternally cool women--for everyone who has ever dreamed of one day living in Paris. Jeanne Damas is a Parisian model, fashion icon, actress, designer, and photographer. She recently launched her own fashion line, Rouje, and starred in the film Rock'n Roll alongside Marion Cotillard. She has collaborated with many international brands, including Gucci, Mango, Nina Ricci, Macy's, and &otherstories and is one of Forbes's "30 Under 30." Lauren Bastide is a French journalist who has previously been the editor in chief of French Elle and a columnist on the famous French television show Le Grand Journal. She currently hosts the feminist podcast La Poudre, France's top independent podcast, in which she interviews inspiring women from diverse backgrounds.